These 1.4m aluminum contact fire staffs are great for everone who loves to spin! This contact fire staff is based on a thick and very tough top quality T6 aluminium shaft, these contact fire staffs are specifically designed for the more experienced and aggressive fire staff spinners as well as for those who like performing contact moves and body rolling staff manipulation Fitted with no less than 50cm x 100mm (19.7 inches by 3.94 inches) of top quality Para-Aramid Kevlar fire wick, each burner will produce a good size flame which will last approximately 4 to 10 minutes depending on the conditions. Unlike other fire staffs around they should not need re-wicking for years! The ends of the shaft are blocked with 2 wooden plugs which are covered in thick heat-resistant aluminum to stop the flames from traveling through the tube. 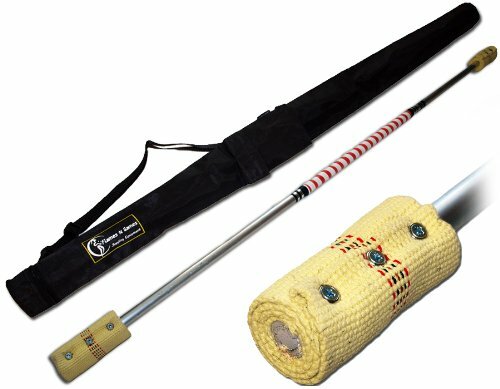 To finish off the staff we have placed in the center a 40cm (15.7 inches) long shock absorbing, Non-slip, padded hand grip which varies in color. Our new single staff travelling bags have arrived!. Ideal for transporting & storing any fire, decorated practice or glow staff. These bags are made from a heavy duty, heat & waterproof material which makes them perfect for storing hot, soaked and smelly fire staffs. It also gives the bag a solid feel and the material is double stitched making it durable and therefore is designed to last for years! After a complete re-design of this single staff bag we have added some extras.The all new adjustable shoulder strap, which can also be removed simply by undoing the large plastic clips on either end and a box type pocket that is big enough to accommodate a wallet, phone and some keys! Flames N Games 1.4m CONTACT Fire Staff. Top quality aluminium staff with quality kevlar wicks. Length: 1.4m (55.17 inches) - Weight: 720g (1.59 lbs) - Both wicks are 50cm long by 100mm (19.7 inches by 3.94 inches) which produce large flames and good long burning time! With this Flames N Games Pro Contact Fire staff you will also receive a Staff Travel Bag worth $15! This contact fire staff is based on a thick and very tough top quality T6 aluminium shaft, these contact fire staffs are specifically designed for the more experienced and aggressive fire staff spinners as well as for those who like performing contact moves and body rolling staff manipulation! Fitted with no less than 2x 50cm x 100mm of top quality Para-Aramid Kevlar fire wick on each end. The fire wick we use does not contain any dangerous copper mesh and is as resistant if not more so than wick that does. The weave itself has been developed to minimise fraying and therefore extending the life span of fire wick. If used and stored correctly this wick should last several hundred burns! Each burner will produce a good size flame which will last approx. 6 to 10 minutes depending on the conditions and unlike other fire staffs around they should not need re-wicking for years! The ends of the shaft are blocked with 2 wooden plugs which are covered in thick heat-resistant aluminium to stop the flames from travelling through the tube and keeping the temperature of the shaft low. To finish off the staff we have placed in the centre a long (40cm) shock absorbing, Non-slip, padded hand grip which comes in many different colours. These long contact fire staffs produce massive flames! If you have any questions about this product by Flames N Games Staffs, Fire Staffs, Contact Staffs, contact us by completing and submitting the form below. If you are looking for a specif part number, please include it with your message.